This release is basically an update of the ISO that fixes a couple of annoying bugs from the 2018.6.25 release with some notable updates and additions. It will mark the last release based on Debian Stretch and sadly it will also be the last release of the 32bit version. Future AVL development will focus on Debian 'Buster' and 64bit only. In the meantime I think this 2019.4.10 version will provide a fast, stable well prepared platform for AV Content creation for quite some time. Refreshed expired Repository Keys for WineHQ and Spotify. Updated and Fixed Repositories for New Cinelerra-GG site. Updated and Synced all Debian and 3rd Party Repos (including KXStudio). Fixed VBox Guest Additions removal script to allow /etc/rc.local to remain executable and enable Automount of external drives. Fixed missing 'linvstconverttree' in LinVST. Removed some obsoleted udev rules. Installed and configured new Numix Circle Theme with AVL Customizations. 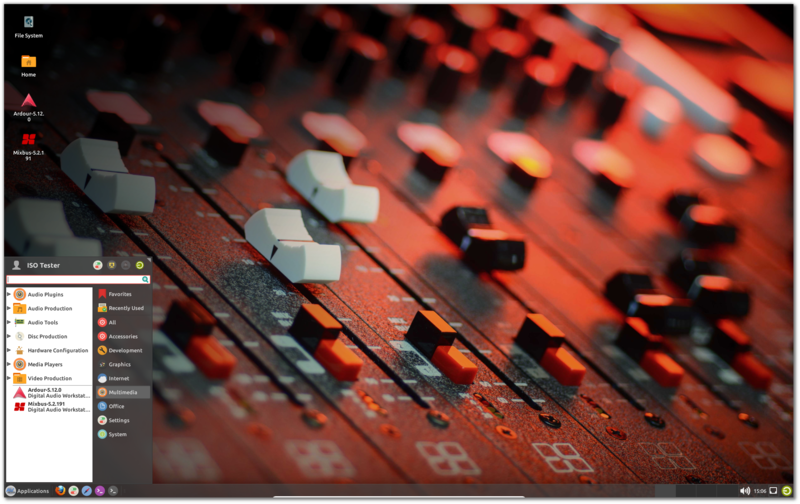 Updated Mixbus Demo to 5.2.191. Updated LSP Plugins to 1.1.9. Updated LinVST to 2.4.3 (now provided and working on 32bit and 64bit ISOs). Removed redundant 'ArdourVST' build on 32bit ISO. Updated Dragonfly Reverb Plugins to 1.1.2. Last edited by GMaq on Thu Apr 11, 2019 4:55 am, edited 2 times in total. Nice! Thanks for keeping AVLinux users updated. I've posted a comment on GitHub also. I have never packaged the LADSPA plugins (only LV2 and LXVST binaries from your project page). Recently my LSP packages were replaced by the KXStudio ones (AV Linux uses the KXStudio Repos). My guess is the KXStudio 'lsp-plugins' packages also contain the LADSPA plugins and the issue is from the package upgrade to 1.1.9. Thank you Glenn for this labour. mk1967 wrote: Thank you very much indeed . I will work on getting organized and uploading some of the other updated packages outside of Debian/KX this weekend. FYI, there is no need to patch the -rt kernel for nvidia anymore. Just the nvidia driver so that it can build the kernel modules I've ran nvidia with unpatched rt kernel for a few months now, with no sign of the original issue (desktop hanging).